Amid the clutter of Jim Miller's office is a mind that refuses to be confined by traditional academic disciplines and boundaries. Since his time in graduate school, Miller has brought together areas of study that others might deem disparate. While pursuing an interdisciplinary PhD in History of Ideas, which required him to study social history, sociology, political theory, and philosophy, Miller worked in journalism as an editor at an alternative weekly newspaper. Seeing no reason to abandon either of his interests, Miller continued to publish pieces-some in Rolling Stone, others in the New Republic-after he secured a teaching position at the University of Texas at Austin. On the strength of his New Republic pieces, Newsweek hired Miller as a cultural critic and wooed him away from the academic world. Miller eventually returned, first teaching part- time at Harvard and later joining The New School full-time. Since the publication in 1987 of Democracy Is in the Streets, an account of student radicalism in the Sixties and the first of his books to appear on the cover of the New York Times Book Review, Miller's goal has been to unite the academic and professional facets of his life and write “intelligent, deeply researched books that are of interest to ordinary readers.” His more philosophical interests led him to write The Passion of Michel Foucault, published in 1992, which explored the idea of living a life beyond good and evil-a work he funded by subsequently writing Flowers in the Dustbin: The Rise of Rock and Roll, 1947-1977. His most recent book, Examined Lives: From Socrates to Nietzsche, appeared in 2011, and became the third of his books to be featured on the cover of the New York Times Book Review. Miller is currently editing a new English edition of Diogenes Laertius' Lives and Doctrines of the Eminent Philosophers for Harvard University Press, a scholarly edition of a third-century AD text central to understanding Greek philosophy that will also be a beautiful book with a rich array of full-color illustrations. Miller brings the same multifaceted approach to his role as director of the Creative Publishing and Critical Journalism program. 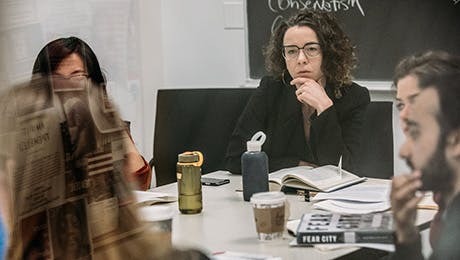 He partnered with Rachel Rosenfelt and Juliette Cezzar to create a truly interdisciplinary program that brings together journalism, publishing, and design and offers both pre-professional career training and a rigorous graduate education. Miller stresses that students seeking a traditional journalism school need not apply. He wants students who are willing to collaborate, to learn by doing, students who will stretch themselves beyond their comfort zones. Learn more about the work being done at The New School for Social Research on our blogs. Why Is Insurgency Good for Democracy?